Heat oven to 400°F. Combine all cookie ingredients in large bowl. Beat at medium speed, scraping bowl often, until creamy. Drop dough by rounded teaspoonfuls, 2 inches apart, onto ungreased cookie sheets. Flatten balls to 1/4 inch thick with bottom of buttered glass dipped in sugar. Bake for 7 to 9 minutes or until edges are very lightly browned. Cool 1 minute; remove from cookie sheets. Cool completely. These Almond Glazed Almond Cookies were baked for week 10(Yikes!) 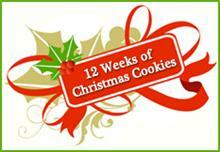 of "12 Weeks of Christmas Cookies." I love almond extract too and these are such pretty cookies. I'd grab one of these first off the cookie tray! Love how delicate the almonds look on top of the cookies. Great job! Beautiful cookies, love the sliced almond slivers on top! Your husband is right! Your cookies really look exquisite! Yummm. I love almond too. My yellow lab would lick you too :) I think he loves anything that smells good. I bet these are awesome with coffee. Wish I had some! Sue, another goodie! We are kindred spirits! I was wondering, have you been able to freeze any? Not here, they get munched away really quickly, or someone takes a plate home. These look too yummy. The cookie party is sooo fun. We do more dipped chocolates than cookies so it has been fun for me to start with the cookies rather than try to get some in at the end. I love almond cookies, especially those almond pillows. These look so delicate and pretty. They wouldn't make it to the freezer at my house. I'll have to try these. Your cookies look great!! I love almond cookies and this looks pretty with that glazing on top. Oh, your cookies look great and bet they are very delicious. This is a must try to add to the list. Cats lick it off also! Between your husband and land o lakes reviews, i am thoroughly convinced to give these a try. These look lovely! These are so delicate and pretty looking. Love the flavor of almond, too. Happy holidays! They look dangerously moorish, just perfect for a Christmas Treat. I loooove almond extract! These look amazing! I love that you can get the slivered almonds still with their skins on. All ours are skinless! I must try these! So simple looking but pretty. I made an almond sweet too this week! Mmmmm. almond! I bet these are exquisite! You are so talented with your cookies. I bet your husband is glad to be your taste tester! I feel the same way about almond extract; love it in anything. These are lovely cookies and with the almond in both the cookie and the glaze, they must taste divine. I'll be making those cookies. I agree with you about almond extract. It really is sensational! And the way you described their taste is just incredible! Yum! I love almond extract as much as you do. I also enjoy lotions and soaps made with almond oils. Heaven! Your cookies are, as always, beautiful! I can just imagine how much work it is to get those almond slices looking so perfect on those cookies. They are so pretty. Almond flavoring always reminds me of the old Jergen's lotion from the 70s and 80s. I think they may have since reworked the formula. Your hubby has said it all. These are really exquisite !! Sue, these look heavenly! I agree about almond extract! I have hand lotion too and I love it!!! Hopefully your grandkids will be less creeped out by their elf soon. That's funny! I really don't know how you do it! I make 3 types of cookies and that's it! And most of the time I won't even allow myself to make them because I know I'll eat them...ALL! You continue to keep me in awe of you! These look delicious. I love almonds so I will be bookmarking this recipe. Thanks for sharing. I just saw this and totally thought of you! What a cute idea. Wow! These look so good. Belli e molto delicati ^_^ ormai farti visita è un goloso appuntamento che aspetto come i bambini attendono il Natale! These cookies are a great holiday cookie. They look so pretty as well as being fairly easy to make. your cookies are so cute and festive. love the sliced almonds on top. they'd go perfect dipped in some milk/coffee as a breakfast treat. These are absolutely picture perfect Sue! I adore almond extract, the aroma is intoxicating! I have a weakness for the almond flavor, too. I will have to make these, but for an occasion where I have to share them or I'd gain 5 pounds overnight. Thank you for sharing it! Hello everyone, it's my first go to see at this site, and paragraph is truly fruitful in favor of me, keep up posting these types of articles or reviews.